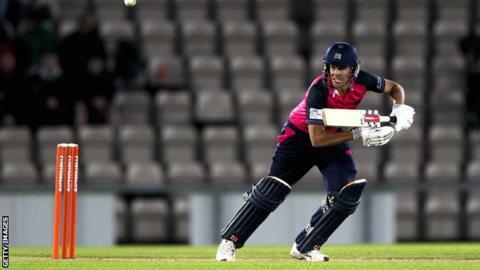 Former England captain Michael Vaughan believes a radical transformation is needed in the domestic Twenty20 game. Vaughan told BBC Radio 5 live: "Who would've said 10 years ago darts would be the second most watched sport on TV? "My wife doesn't like darts but something comes through the screen, an atmosphere. When you put Twenty20 on, nothing comes through so we turn off. "We've got to try to create nine teams, make it a bit different and create the 'wow' factor." This year marks the 10th season of domestic Twenty20 competition in England and Vaughan said: "In the first couple of years it was brand new, razzmatazz, the audience saw something very fresh and liked it, went to watch it. "The one thing we can't control in the UK is the weather which definitely plays a part in terms of the people that go and watch, but I look at all the other Twenty20 tournaments around the world - including the Indian Premier League and the Big Bash in Australia - and there is definitely more wow factor." The lucrative IPL completed its fifth annual tournament this year as a Kolkata Knight Riders team featuring South African Jacques Kallis and Australian Brett Lee beat the Chennai Super Kings, containing South African Albie Morkel and Australians Mike Hussey and Ben Hilfenhaus. "You see a different format, more of a show being put on, away from just the cricket, and I think that's very important," Vaughan said. "We in this country seem to have this long drawn-out affair, we can't really get to grips with how it works, the spectators will go and watch because they watch cricket anyway rather than it being something new." This year's domestic Twenty20 group matches have now been completed and attention turns to the 40-over competition before the T20 quarter-finals are played on 24 and 25 July, with the semi-finals and final in Cardiff on 25 August. "I really think a window of two-and-a-half weeks [is needed] when the whole country is geared towards Twenty20 cricket. People might say 'oh the weather might affect' but that's just life, the weather can affect any day given the nature of our country," Vaughan added. "I think England players are very important in this, I know in the Big Bash the Australian players didn't play a massive part but they had really good overseas players. "In our season we don't seem to be able to get the big overseas players. "An England player against an England player would be a great sell, a Pietersen versus Swann - I'd like to see that. I think a lot of people would buy a ticket to see that kind of event and it would really jazz it up and make it somewhat different to what we've got. "You've got to turn the telly on and get this energy through the screen. If I turn and see no-one watching, no real names, you're not going to get many people interested. "We've got to take it to grounds that are successful. Hove is a very successful ground in Twenty20, Taunton also, Essex produce a wonderful evening, I think it's only Essex that I turn the screen on and think this is quite a good event, big crowd, lot of buzz, lot of energy but 80% of the games are not like that so we've got to try and create that atmosphere more often." You can listen to the programme again until 15 July on the BBC iPlayer.